Ace the pit bull was out walking with his dad as usual when suddenly, he pulled him off course. 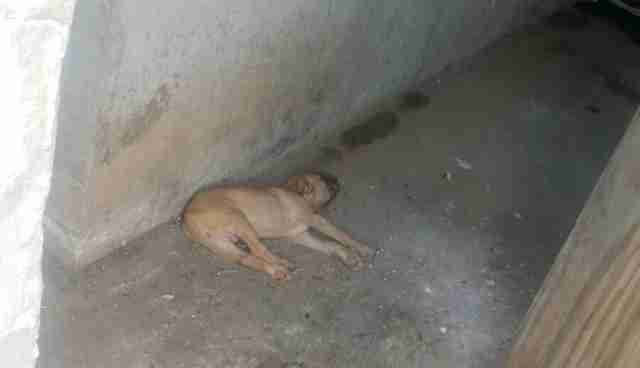 The young dog led his dad towards an abandoned home and into the alleyway next to it - where they found a tiny puppy, struggling to survive. 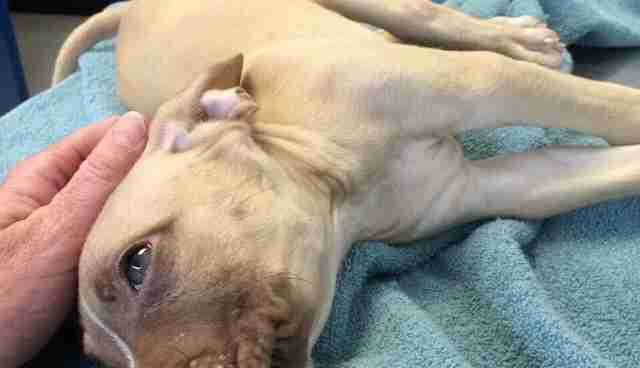 Upon finding the injured puppy, later named Theo, the man rushed him to a local shelter in New Jersey to get the help he so clearly needed. Second Chance Rescue NYC heard about Theo shortly after he was rescued and immediately took him in. "When we first got him we weren't sure he was going to live, and he had a few scares but now he is currently improving at the vet and we couldn't be happier," Alyssa Ellman of Second Chance Rescue NYC told The Dodo. When the rescue first took Theo in, he could barely move around at all and appeared to be blind. 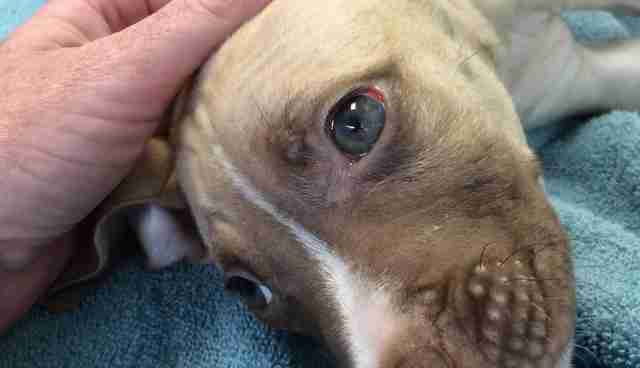 The 10-week-old pit bull mix refused to give up though, and slowly but surely began to improve - including regaining his vision, a minor miracle. "We are so hopeful for this boy, he has to live," Ellman said. Theo is now able to stand up on his own and even move around a little bit. 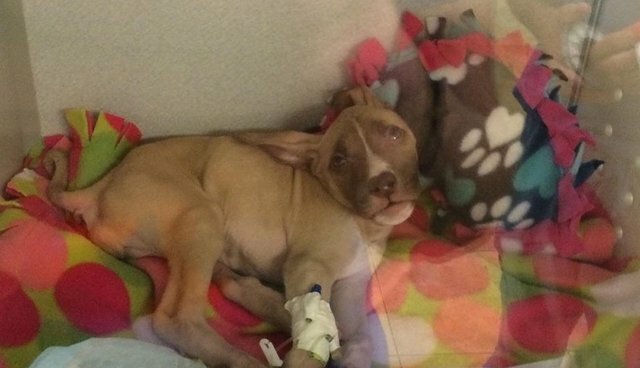 The puppy no one thought would survive is improving every day, and it's all thanks to Ace, the pit bull who somehow knew just where to find him. 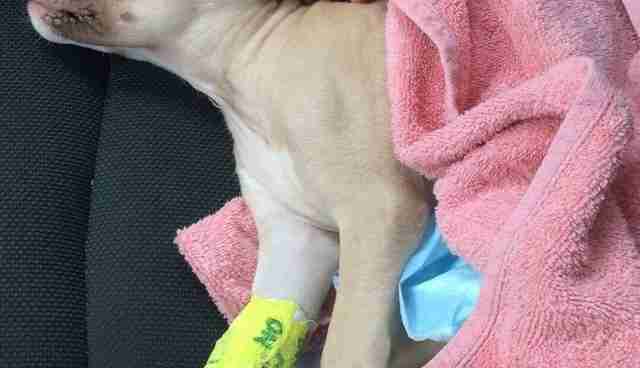 "If it wasn't for Ace the dog, Theo would most likely never have been rescued," Ellman said. "We really owe it all to that hero of a dog. Everything happens for a reason and Ace and his owner were walking by that house to unknowingly save a life." 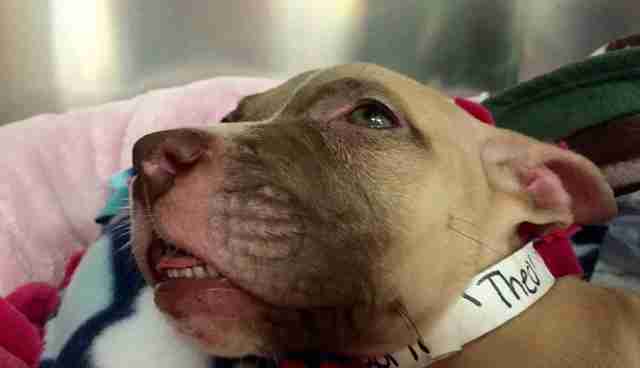 If you'd like to help Theo on his journey to recovery, you can donate to Second Chance Rescue NYC.